July 2017 – a new version of our GoTheatrical App for iOS and Android devices has just been released! If you have already installed the app on your mobile or tablet device, please follow these simple instructions to install the latest version of the app. If you don’t have the app yet, please see our downloads page for more information on how to install it for the first time. To update your GoTheatrical App, tap the AppStore icon on your device, then select the Update menu on the bottom right of your screen. Scroll down until you find the GoTheatrical icon. 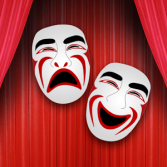 Simply tap the Update button to install the latest verson of GoTheatrical. Open the app and test that it’s working by tapping Select Show and then selecting Test Captions from the list. If you are seeing test captions, the new version of the app is working perfectly! If not, wait a minute or two as our test captions may be in the process of restarting. If still not working, please send us a note and we’ll help out. To access updates on Android devices, please go to the GooglePlay app on your device and search for GoTheatrical. Then follow the instructions to install the app.